A concept vehicle is the equivalent of a one-of-a-kind designer garment, created to demand attention on the runway, then toned down for the rack. I know this, and yet… I can’t help dreaming about the day the concept vehicle goes directly from auto show to driveway. Take, the Hyundai Curb, for example. One can only guess at the choice of names. The automaker dubs the Curb an “Urban Activity Vehicle” so, maybe it’s meant to curb boredom? Which it does… with its wrap-around windshield and extended rims, the Curb pushes automotive aesthetics to a new level… if you like beefy vehicles, anyway, which I do. And as rugged as the exterior may be, the interior is a techie’s paradise featuring a dashboard-wide display screen, smaller screens on the rear of the front headrests and quick-drying seat material, for all you surfers using GPS to find the biggest waves. It’s a giant toy that’s expected to get up to 40 mpg on the freeway! So, yeah, should Hyundai’s 12th concept vehicle ever make it market, I wouldn’t hesitate to proudly feature one in my driveway. Or maybe out on the street, you know… on the curb. I wish they would give it a better name than Curb. 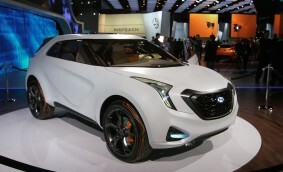 The concept looks great and 30 mpg with a turbo in the city should be a funny car to drive. We don’t claim to know what the company was thinking when it came to naming the Curb but you have to admit, it does kind of have “curb appeal”! Previous Previous post: “Falling Skies” Premiere Features Limited Commercial Interruptions – Now We’re Talkin’! Next Next post: We’re Holding the First Ever Butler Auto “Pets & Rides” Photo Contest!